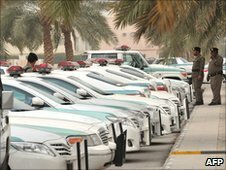 I took a taxi from our hotel at midnight on Thursday to find police cars with their lights flashing parked at five-metre intervals along all the main streets in Riyadh. I was pulled over by the police for merely filming on my mobile phone. On Friday, the city woke up to the sight of more police on the streets than people, and the atmosphere was tense. The anti-government "day of rage" rallies calling for democratic reforms - not revolution - in this oil-rich kingdom were supposed to start after midday prayers, but people stayed away. It was hardly surprising, given that over the past few days there had been warnings in the newspapers of the punishments demonstrators could expect - lashings and imprisonment. And then there is the surveillance and intimidation. Yet demonstrations have been gathering momentum throughout Saudi Arabia. It was reported that police opened fire on protests in the eastern provinces - home to the Shia minority - on Thursday night. We went to the eastern town of Dammam to meet the families of political prisoners - some of whom have been held without trial for up to 16 years. 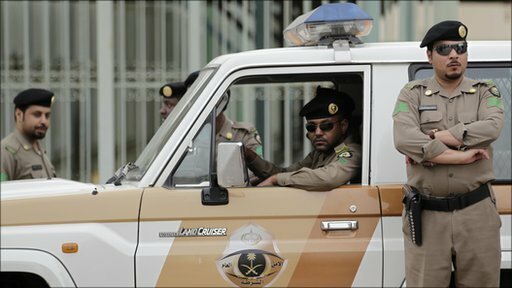 Opposition activists say there are some 30,000 political prisoners in Saudi Arabia, the government puts the figure at one third of that. We didn't know we were being followed by the security forces, and after we had finished filming we were arrested and our tapes taken from us. The message is clear - people should not protest, and if they do, journalists should not report it. On Friday, I was due to meet one of the demonstration organisers who said he would accompany me to see the protests. But an hour before the rally was due to begin, I received a text message. "My emails and mobile phone are being monitored. I cannot meet you. I am sorry. This is a sad day for Saudi Arabia." Demonstrations are illegal in the autocratic kingdom of Saudi Arabia, a country with no legal political parties or mass movements that has been governed by the House of Saud for 80 years. The government claims people have no need to demonstrate because they have a method of government that works. But one opposition spokesman described his country to me as "a police state masquerading as a theocracy". We journalists were herded into buses on Friday and taken to see the "day of rage" non-event. Helicopters hovered overhead, there were road blocks and cars being searched, hundreds of police cars and thousands of police - but not a demonstrator in sight. Suddenly, as we were all getting bored of filming each other, a solitary man in his 40s, dressed in casual Western-style t-shirt and jeans approached us. "We want freedom. We want democracy," he shouted. "Why are you saying this, in front of all the police?" I asked him. "I shall go to jail, I know," he replied, shaking with nerves and frustration. "But the whole country is a jail. I had to speak out." Within a few minutes, the man was surrounded by a dozen or more journalists, he was the only one in Riyadh on Friday giving a press conference. There were so many of us there that there was nothing the police could do except speak nervously into their mobile phones and then shepherd us all back into our buses. But I refused to go and accompanied the man to his car. I asked for his phone number and shall call him at home - but I don't expect him to answer.